When I was in Junior High, although at that time it was called Grade 7, I used to read the Archie Comics my sister used to buy. I liked Archie but could never figure out why he was interested in Veronica because Betty was so nice. Jughead simply irritated me. 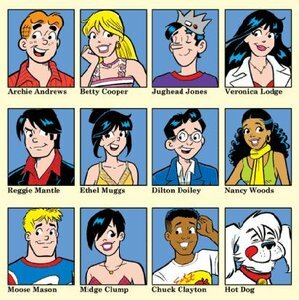 When I got to High School I found that Archie was a bit idealized but I still enjoyed them. I haven’t looked at an Archie comic since 1993 until a few weeks ago here in San Miguel when I realized that I was living in an Archie Comic. Are they in High School? Reggie and Midge had a big fight over whether or not Mr Weatherbee needed to go on a diet. Reggie thought he was fat and Midge not. So Midge stormed out of the party taking Moose with her. Betty wanted to have a party for Ethel Muggs who was going to New York for a week. Betty asked Ethel who she wanted at the party. Ethel gave her a list of the gang, including Reggie and Midge and Moose. When Midge found out that Reggie was going to the party she decided not to go. She told Moose that he couldn’t be friends with Reggie because of what he had said to her at the party. At the party Archie asked Betty where Midge and Moose where and soon found out. He then asked Reggie what had happened. Reggie started going on about Midge and how she favored fat people..
See what I mean! This is high school but real life to some people who have moved here. There are Gangs within Gangs. I want Archie to solve all this and make the world a happy place again. Why can’t Archie bring back the Magic and Harmony that is San Miguel. Why can’t he get these people to act like they graduated instead of still being in high school. Not surprising. In general, American are “les grands enfants.” They are always adolescents. It is their ideal. My, my. Where do you get your ideas? You little devil, you! It must be something in the Latino air because much of Mexican life is quite similar to high school.